Domaine de la Romanée-Conti has always been the name in Burgundy, and their wines possess an almost mythical quality that is rarely exhumed from Pinot Noir or Chardonnay. The Liv-ex Power 100, which tracks the most powerful brands in fine wine, ranked DRC in first place for 2012, and it currently sits nestled between Latour and Le Pin in 15th place. 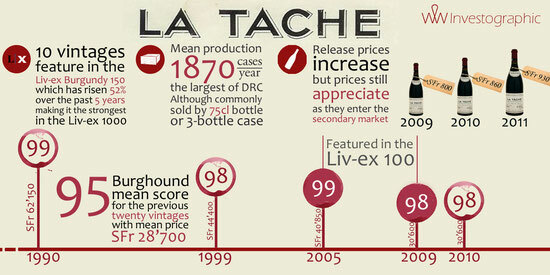 Demand for DRC is notoriously high for the en Primeur allocations, and the secondary market is ever conscious of fraudulent or refilled bottles. 26 hectares are shared between 8 Grand Cru vineyards that include the monopoles of La Romanée-Conti (1.8 hectares) and La Tâche (6 hectares). The former produces just 440 cases per year on average, and case prices are upwards of SFr 160’000 for the best vintages, such as 2005. The latter, on the other hand, produces an average of 1870 cases per year, at prices around SFr 41’000 in great vintages. Thus, both monopoles produce the same revenues for DRC, despite the differing sizes. Two vintages of La Tâche feature in the Liv-ex 100, and the 10 most recent physical vintages feature in the Burgundy 150, a sub-category of the Liv-ex 1000. Over the last five years it has been the ‘lesser’ vintages that have outperformed the Burgundy 150 index, an example being the 2004 that has risen 120% since 2009 with a score of 95 points from Allen Meadows (Burghound). Mature back-vintages such as the 1990 exhibit stable merchant prices, although auction prices and secondary market trades have been made for almost 30% below these values. Nevertheless, La Tâche still shows good opportunity for the 2009 and 2010 to appreciate in line with the 1999; and vintages like 2006 have some headroom also. The most promising signal we take from La Tâche is that the mean market price for the last twenty vintages is still rising: nearly 3% in the last twelve months. If the top end of the market is still rising, then there is certainly scope for continued price growth across the Burgundy segment of the market; especially given the growing positive sentiment for these wines outside of Europe. Wine Wealth is a consultancy guiding investors on wine as a form of investment. Further information can be found about our service offering, or by contacting us.